You watched him strutting towards you. Tail feathers spread out into a taunting fan, chest puffed out, beard dragging and a booming gobble that left no doubt of his maturity. You pull the trigger and pick up his lifeless body enthusiastically because he will make a fine meal. With such a great hunt in hand, it is only right that you keep the memories by mounting the beard and tail long after your meal. Taxidermy should be left to the professionals- real artists that require special equipment as well as processes to get the best hunt as well as turkey mounting plaque. However, mounting a turkey tail and beard can be swift, easy and a gratifying end to a hunt. Here are a few tips on how to successfully mount the turkey’s feathers for displays at home for all your buddies to see. Extracting the turkey beard is one of the easiest tasks in the process of mounting turkey’s feathers. Simply cut the beard at its base, but leave enough skin attached to hold it together. Apply generous amounts of borax to the base. Then, transfer some borax into a container and place the skin of the beard inside. 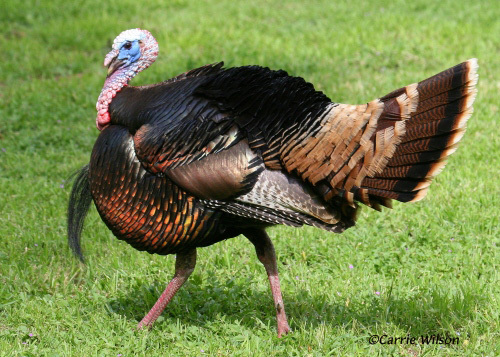 To separate the tail from the rest of the turkey, begin by feeling for the triangular base of the skin that attaches the tail feathers to the body and cut it off. Lay your tail section on a hard flat surface, and with the edge of a knife carefully trim any meat from the base of the quills without eliminating the connective tissue between them. You can wash your tail in warm water with dish soap and rinse off to remove blood and dirt. When all the excess meat is scrapped off, liberally apply borax to the entire base and rub it in vigorously. This is to prevent rot and insects. Spread your tail on plywood. Ensure that the bottom feathers are parallel. Remember that after your feathers are dry moving them will be impossible. Secure each feather with a small pin, nail, or staple at the bottom then arrange each feather carefully and spread out the fan. Lastly, cover the tail with a piece of cardboard and tape the two pieces together. Wait for a period of seven days for your feathers to dry up. The final step is mounting which requires a mounting plaque. Different stores offer a large variety of mounting plaques that are made of cedar, walnut or oak. Look through different online stores to find an affordable and desirable Turkey mounting plaques like the ones you can find at Stump Jumper Designs. Afterwards, remove your tail from the cardboard and the beard from the container. Remove excessive borax. Simply slide the fan into the slot on the panel. Most mounting plaques will have a hole at the bottom for the beard. Coat the end of the beard with hot wax and insert it into the hole in the panel. There are no limitations to the designs you could use to mount your tail and beard. Explore various designs and choose one that displays your art at its best. Finally, hang your turkey mount on the wall for all to admire and to preserve the memory of a successful hunt.